Heading south from the Mauritanian capital in mid September the desert gradually gave way to dry savanna and bush and as we neared the Senegal border the countryside took on an ever more tropical feel. After the solitude of the Sahara, passing the simple compounds of mud-brick huts and watching the daily goings-on of the villagers was a welcome distraction. As the afternoon temperature rose, groups gathered for a chat or a snooze under shady trees and many called out to us to come and have a rest. Having an entirely different conception of time and urgency, they were clearly baffled when we politely declined their offers, explaining our rush to reach the border. We arrived in the frontier town of Rosso just as the sun was setting and perhaps it was just as well since the dimness masked some of the town's squalor and filth. Border towns are often dodgy places full of shady characters looking to make a quick buck on black market goods or dubious deals changing money, and Rosso was no exception. The immigration office having closed down for the day, we took a room in the town's tourist class hotel after Amaya turned her nose up at the budget accommodation which offered a dingy room with a couple of bare mattresses on the floor, leaky plumbing and the distinct oder of greasy food wafting up from the eatery below. Cost cutting has its limits. Crossing the border proved trying. After being allowed behind the port barricade a uniformed official snatched our passports and disappeared without a word. We were herded on to the overcrowded ferry and wedged in between the vehicles, still wondering what had happened to the immigration agent. He appeared sometime later and demanded 20 euros for the 'formalities'. We had no intention of contributing to corruption, so under the guise of just wanting to have a look at the exit stamps, Amaya snatched back the passports and quickly hid them safely in her money belt. Seeing his chances for a hefty bribe greatly diminished, the official became livid and insisted we disembark immediately. We ignored his clamors and eventually he gave up insisting we pay the formality fee, surely sensing our resolve not to part with any of our cash. 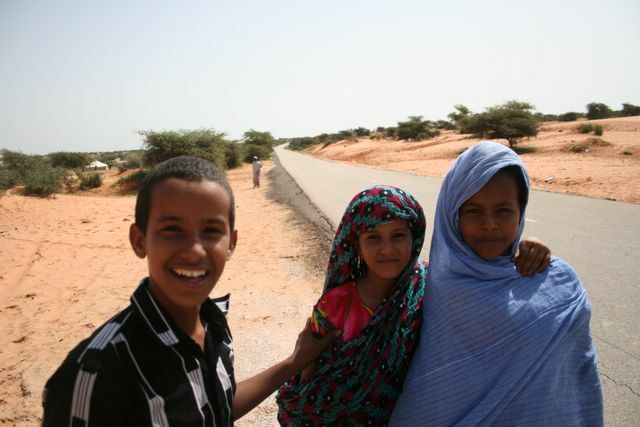 Once across the border a quiet backroad meandered through lush countryside dotted with acacia trees and in each village we passed we were greeted with enthusiastic shouts of 'Toubab', as whites are referred to in these parts. We weren't used to causing such a stir and by the end of the day we were hoarse, having tried to match the locals' exuberant greetings village after village in a fairly heavily populated area. Our first stop in Senegal was the former French capital, St. Louis. The houses are crumbling but the town still has a bit of flair and the surrounding wetlands made for a pleasant enough excursion. We ended up spending several days in St.Louis waiting for the customs agent at the post office to return from his holiday, so the backlog of parcels could be inspected and we could finally pick up our long-awaited package containing new tires. Patience folks, this is Africa! Dreaded Dakar, notorious for congested roads, pushy street vendors and oppressive heat, was our next stop. In fact, we would gladly have avoided the capital entirely, but a need to pick up a visa for The Gambia necessitated a visit. We made the best of things and chose to stay in the nearby fishing village of Yof rather than in the heart of one of West Africa's mega-cities. From the terrace of the guesthouse we watched the sunrise over the Atlantic and peered down at the hustle and bustle as the fisherman set off in their motorized pirogues. Late afternoon the beach was again abuzz with activity as the men returned with the daily catch, fishmongers vied for customers and boys tossed around a soccer ball among the stout women gutting the tuna and barracudas. This being the month of Ramadan, and the region being predominately Muslim, fasting is the norm for most people from sunrise to sunset. Restaurants are open but we're often the only customers and invariably the only thing on offer is Chep-bu-jen--fish and rice. Delicious the first 20 times, but after that a bit monotonous. The Gambia, just over 300 kilometers in length and never more than 50 kilometers from north to south, slices through Senegal and takes its name from the river it surrounds. This tiny English-speaking country is a popular destination with British package tourists escaping the drab winter back home. If you confined yourself to the 10 kilometer beach strip where the hotels, restaurants and bars are all congregated, you would certainly have the impression that the country was fairly well-off. 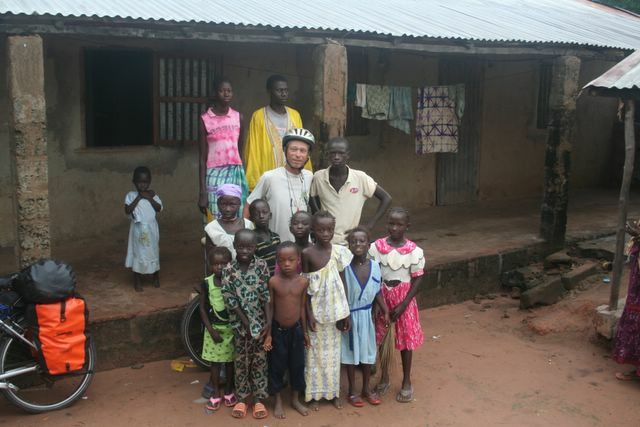 Venture further inland and another side of Gambia unfolds. 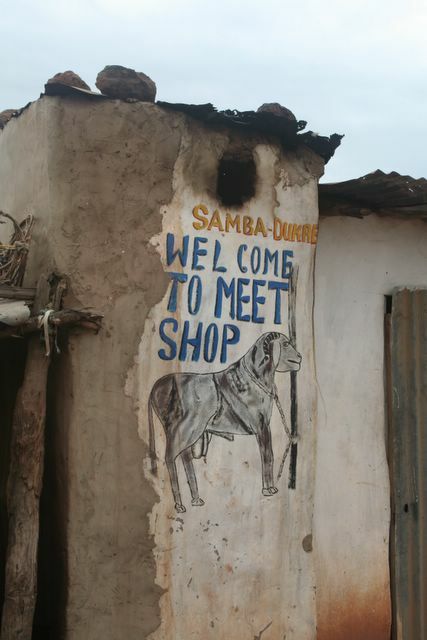 The country is poor, even by African standards and the people are struggling to make ends meet. Basic goods are not cheap and there's little on offer in the local markets-- sweet potatoes sold in piles of three or four, a few onions, some okra and perhaps an over-priced aubergine or two if you're lucky. Pasta is sold in minuscule quantities, the smallest bag can't be more than 25 grams. Even bananas are sometimes hard to come by. Amadou, a newly-qualified and highly-motivated teacher who invited us to have a rest and a look at his school, can barely get by on his monthly salary of 1,800 Dalasis (approx. 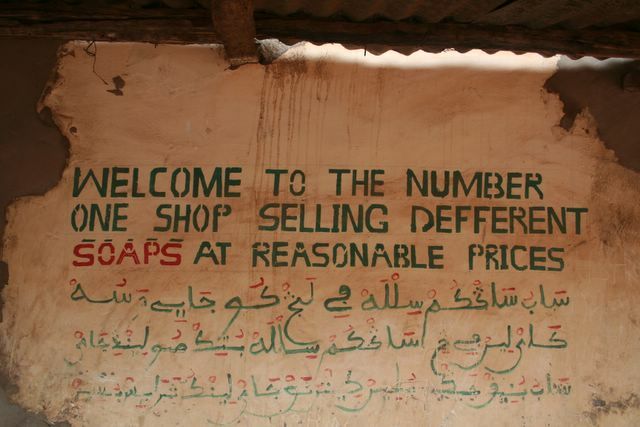 50 euros) and farmers find it hard to pay for goods such as soap, gas and cooking oil. On a more positive note, school fees for girls have been abolished which means education is now more accessible than ever for females in the country. NGOs abound, new schools are being constructed and safe drinking water is readily available from the town pump or well even in the smallest of villages. Cycling the south bank road we attracted the usual swarms of youngsters waving wildly after the toubabs and hoping for some handouts--money being top on the wish list. Riding along dodging the potholes also turned out to be a good way to get to know Gambians as the roads are busy with children on their way to school, groups of women filing past balancing loads of wood or buckets of water on their head, and men going off to work. We got a first hand glimpse of life in the countryside when the head of a roadside village invited us to spend the night in his compound. The chief is a man of 80 who lives with his extended family--about 100 people in all we were told--in a series of mud-brick dwellings surrounding a central courtyard. 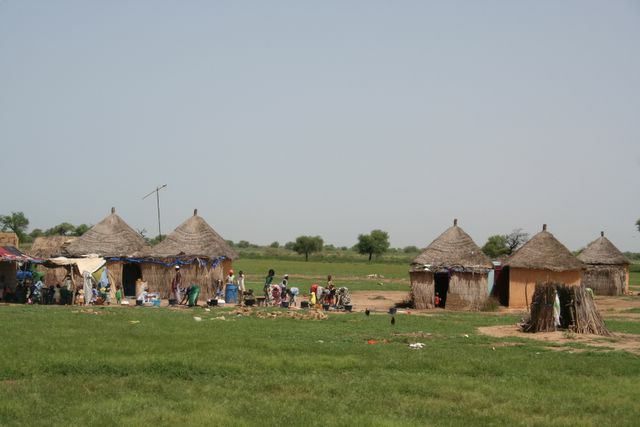 There was a flurry of activity upon our arrival as the men concurred as to where to lodge us, children scurried off to fetch buckets of water and the women rushed about rustling up a meal for us. The villagers were truly hospitable and we were mighty thankful for a roof over our heads when a violent storm broke out in the wee hours of the morning. The next evening we were again saved from a wet night in the tent (no hotels in the vicinity) when a schoolboy, Moutar, invited us to stay with his family. 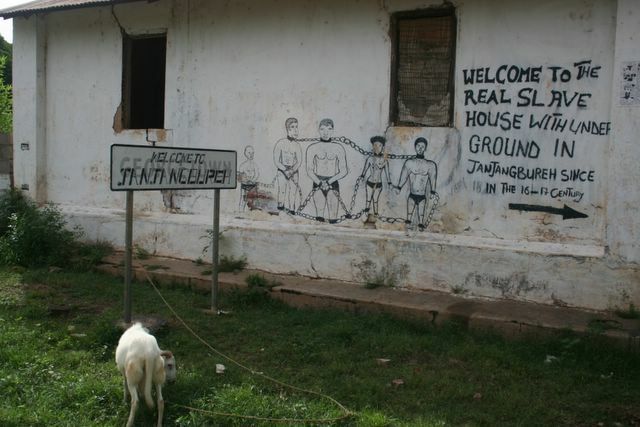 Their compound was simple and lacked the few 'luxuries' of the chief's. There was no radio or kerosene lamp and the children were running around in rags. Nevertheless, the family had somehow found the money to pay Moutar's school fees, there was abundant rice and fish and lots of laughter. 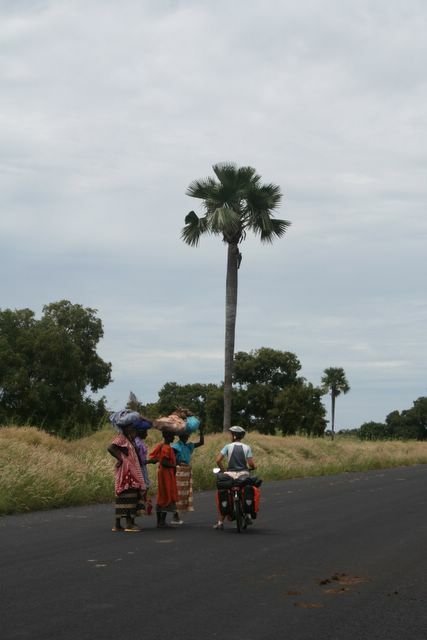 After our tour of The Gambia, we crossed back into Senegal and the picturesque, but troubled Casamance region. 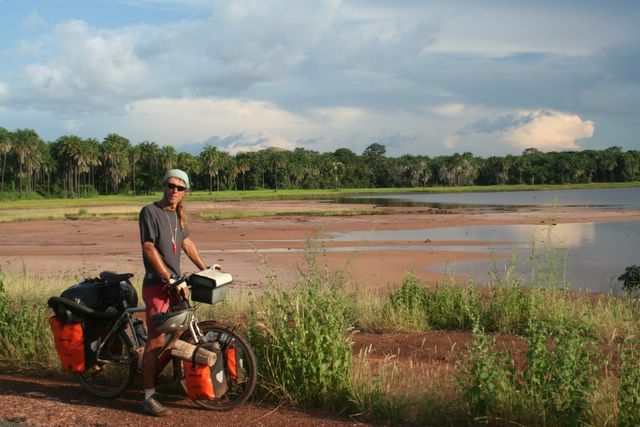 Humidity was high and the tension palpable as we cycled through the forests of hardwood trees and past emerald green rice fields to reach Ziguinchor. 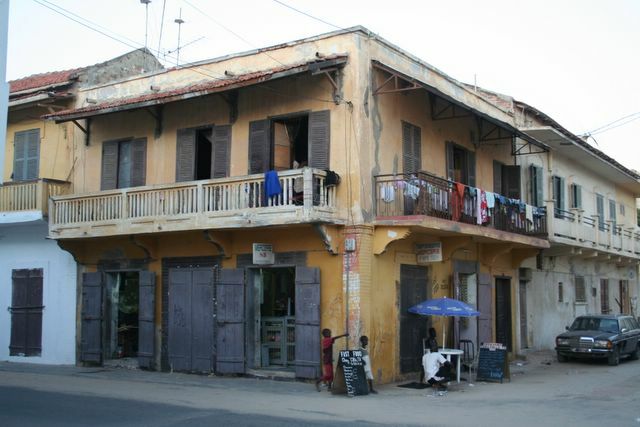 Once Senegal's leading tourist area, rebel activity and sporadic fighting have kept visitors away in recent years. We were told the area is calm at the moment, but truckloads of nervous-looking soldiers poised for action and tanks rolling past put us off from exploring the backroads. While the past month has been devoid of 'attractions and highlights', it has been a good introduction to Africa and its people. We have found the locals to be kind, friendly and exceedingly optimistic in spite of conditions that are sometimes appalling. Africans are also a people on the move. We've met Mauritanian shopkeepers in The Gambia, a woman from Sierra Leone tending a restaurant in Banjul, a Nigerian man selling his art in St. Louis and countless others who have worked outside of their home countries, all hoping to better their situations. One afternoon in Banjul Eric even ran into a young Gambian he had met a month back in Mauritania's northern city, Nouadhibou. The man had come north looking for work and then got stuck toiling as fisherman when his money ran out. He was hard up and couldn't afford the trip back home. Fortunately for him, when election time in the Gambia rolled around the president sent three buses up to Mauritania to bring back the voters free of charge. These kinds of chance encounters, rather than imposing monuments and temples, have made the month memorable. Tomorrow we'll take to the road again and have a chance to brush up on our limited Portuguese as we spend a few days in Guinea Bissau. 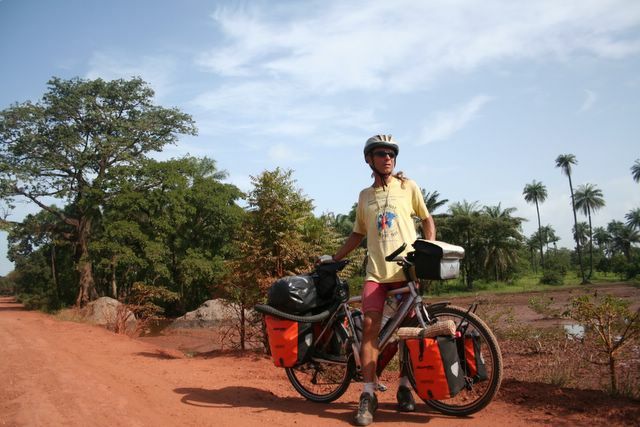 Then it will be on to Guinea where we hope to find more plentiful fruit and vegetables and also more strenuous cycling as we tackle the hills of the spectacular Fouta Djalon region. 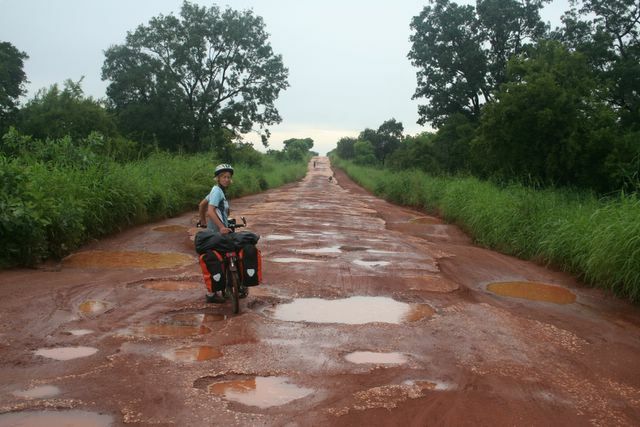 The roads there--often no more than dirt tracks--are said to be unpassable in the rainy season which is just winding down. Let's hope for dry weather!